She is a national champion, a former activist and a centenarian. And she runs. By NOAH REMNICK and ERICA BERENSTEIN on Publish Date April 22, 2016. Photo by Elias Jerel Williams for The New York Times. 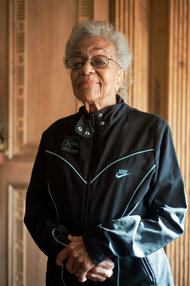 On a cloudless Sunday afternoon in April, a 100-year-old woman named Ida Keeling laced up her mustard yellow sneakers and took to the track at the Fieldston School in the Bronx. Her arrival was met without fanfare. In fact, no one in the stands seemed to notice her at all. It is possible the spectators were distracted by the girls’ soccer game taking place on the field. Or perhaps they were simply unaware that Ms. Keeling is a reigning national champion. When she runs, Ms. Keeling occupies a lane all her own. She has held several track-and-field records since she began racing in her late 60s, and she still has the fastest time for American women ages 95 to 99 in the 60-meter dash: 29.86 seconds. 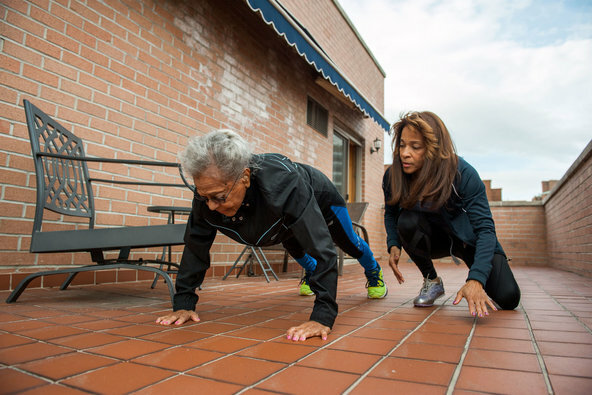 In the week to come, she plans to compete in a 100-meter event at the Penn Relays in Philadelphia, where she hopes to establish a new standard for women over 100 years old. Ms. Keeling was not always such an accomplished runner. As a child growing up in Harlem, she preferred riding bikes or jumping rope. With Title IX half a century away, there were few opportunities for girls, let alone black girls, to play organized sports. When she did run, it was always to race, never to exercise. When the Depression hit, Ms. Keeling’s athletic inclinations receded into memory, supplanted by a series of jobs washing windows and babysitting for neighbors. Her family, who for years lived in cramped quarters in the back of her father’s grocery, was forced into even more humbling circumstances when the store went out of business and her father began peddling fruits and vegetables from a pushcart for a living. Ms. Keeling’s resilience only deepened with time. After her husband died of a heart attack at 42, she was left to raise their four children on her own. She moved the family into a one-bedroom apartment in a Harlem housing project and took up work sewing in a factory, all the while contending with the abuses and indignities endured by black women in mid-20th-century America. As the civil rights movement took shape, Ms. Keeling became an active demonstrator, shuttling her children to Malcolm X speeches and boarding a predawn bus for the 1963 March on Washington. “I always understood from mother that you die on your feet rather than live on your knees,” said her daughter Shelley Keeling. Over time, that resolve was gravely tested. While serving overseas in the Navy, Ms. Keeling’s older son, Donald, developed a crippling drug addiction that he struggled to shed even after returning home to Harlem. His habit ensnared his younger brother, Charles, who had served in the Army. Ms. Keeling watched in horror as both boys, barrel-chested charmers who friends joked looked like superheroes, withdrew into the world of drugs. In 1978, Ms. Keeling received a call from the police informing her that Donald had been hanged. Around two years later, the phone rang again: Charles was dead — beaten in the street with a baseball bat. Both killings were suspected to be drug-related; neither was ever solved. As Ms. Keeling fell into a deep depression, her health began to falter. Her blood pressure shot up, along with her heart rate. The image of her once-vital mother in such despair shook the younger Ms. Keeling. A lifelong track-and-field athlete whose trophies fill an entire room of her apartment, she intervened with the means of healing most familiar to her: running. After some coaxing from her daughter, Ms. Keeling, then 67, registered for a five-kilometer race through Brooklyn. It had been decades since she had last gone running. The two women took off together, but the younger Ms. Keeling soon darted to the front of the pack as her mother drifted far behind. After a suspenseful respite, was relieved to see her mother scamper across the finish line, barely out of breath. So began the sunset career of Ida Keeling, at a time when most of her peers were settling in for a future of seated yoga or abandoning athletics altogether. In the decades since, she has traveled across the world for competitions. She often races alone, the only contestant in her age group. To maintain her health, Ms. Keeling adheres to a stringent regimen of diet (“I eat for nutrition, not for taste”) and exercise (“I’ve got to get my hour in every day”). 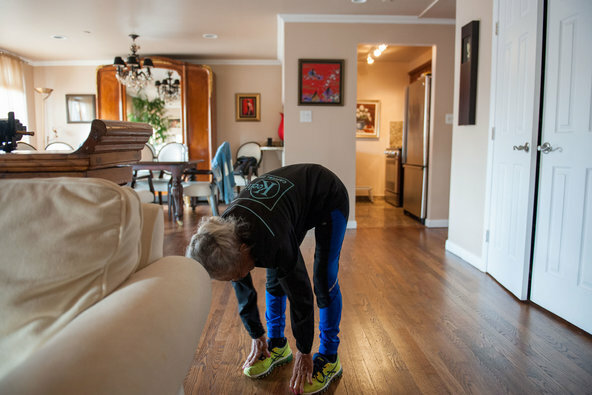 On a recent afternoon, Shelley Keeling led her mother through a routine that included push-ups, wall sits, shoulder presses and sprints back and forth on the balcony of her apartment in the Riverdale section of the Bronx. Ms. Keeling lives alone and says that self-sufficiency is a key to her longevity. Ms. Keeling eschews food products with preservatives, favoring fresh grains and produce, along with limited portions of meat. Desserts are rarities, and a tablespoon of cod-liver oil supplements breakfast most mornings. Despite her exceptional discipline, Ms. Keeling allows herself one indulgence. “This is putting gas in the car,” she said before downing a tall shot of Hennessy. As she navigated the track at Fieldston, a nasty cramp shot up her right leg, hobbling her gait. For a moment she seemed to hesitate as she let out a deep sigh and slowed her pace. But then Ms. Keeling dispensed with the pain the only way she knew how. She ran through it. 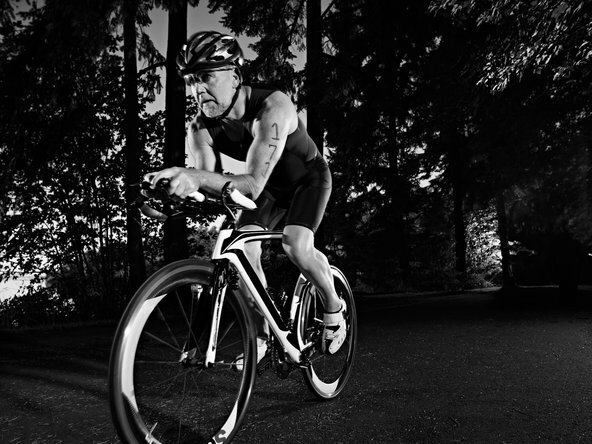 To keep our muscles healthy deep into retirement, we may need to start working out more now, according to a new study of world-class octogenarian athletes. The study found substantial differences at a cellular level between the athletes’ muscles and those of less active people. Muscular health is, of course, essential for successful aging. As young adults, we generally have scads of robust muscle mass. But that situation doesn’t last. Muscles consist of fibers, each attached to a motor neuron in our spinal column by long, skinny nerve threads called axons. The fiber and its neuron are known as a muscle unit. When this muscle unit is intact, the neuron sends commands to the muscle fiber to contract. The muscle fiber responds, and your leg, eyelid, pinky finger or other body part moves. But with each passing decade, we have fewer motor neurons. So some muscle fibers, bereft of their original neuron, do not get another. These fibers wither and die and we lose muscle mass, becoming more frail. This process speeds up substantially once we reach age 60 or so. Scientists have not known whether the decline in muscular health with age is inevitable or whether it might be slowed or altered. There have been encouraging hints that exercise changes the trajectory of muscle aging. A 2010 study of recreational runners in their 60s, for instance, found that their leg muscles contained far more intact muscle units than the muscles of sedentary people of the same age. But whether exercise would continue to protect muscles in people decades older than 60, for whom healthy muscles might be the difference between independence and institutionalization, had never been examined. So for the new study, which was published last week in the Journal of Applied Physiology, researchers from McGill University in Canada and other schools contacted 29 world-class track and field athletes in their 80s and invited them to the university’s performance lab. They also recruited a separate group of healthy but relatively inactive people of the same age to act as controls. At the lab, the scientists measured muscle size and then had the athletes and those in the control group complete a simple test of muscular strength and function in which they pressed their right foot against a movable platform as forcefully as possible. While they pressed, the scientists used sensors to track electrical activity within a leg muscle. Using mathematical formulas involving muscle size and electrical activity, the scientists then determined precisely how many muscle units were alive and functioning in each volunteer’s leg muscle. They also examined the electrical signal plots to see how effectively each motor neuron was communicating with its attached muscle fiber. Unsurprisingly, the elite masters athletes’ legs were much stronger than the legs of the other volunteers, by an average of about 25 percent. The athletes had about 14 percent more total muscle mass than the control group. More interesting to the researchers, the athletes also had almost 30 percent more motor units in their leg muscle tissue, and these units were functioning better than those of people in the sedentary group. In the control group, many of the electrical messages from the motor neuron to the muscle showed signs of “jitter and jiggle,” which are actual scientific terms for signals that stutter and degrade before reaching the muscle fiber. Such weak signaling often indicates a motor neuron that is approaching death. In essence, the sedentary elderly people had fewer motor units in their muscles, and more of the units that remained seemed to be feeling their age than in the athletes’ legs. The athletes’ leg muscles were much healthier at the cellular level. “They resembled the muscles of people decades younger,” said Geoffrey Power, who led the study while a graduate student at McGill and is now an assistant professor at the University of Guelph in Ontario. Of course, this type of single-snapshot-in-time study can’t tell us whether the athletes’ training actually changed their muscle health over the years or if the athletes were somehow blessed from birth with better muscles, allowing them to become superb masters athletes. 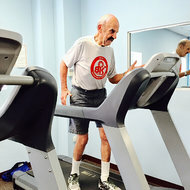 But Dr. Power, who also led the 2010 study, said that he believes exercise does add to the numbers and improve the function of our muscle units as we grow older. Whether we have to work out like a world-class 80-year-old athlete to benefit, however, remains in question. Most of these competitors train intensely for several hours every week, Dr. Power said. But on the plus side, some of them did not start their competitive regimens until they had reached their 50s, providing hope for the dilatory among us. Ask Well: 20 Seconds to Better Fitness?